Our guided tours take in the best mountian biking single tracks on the Barrington Coast. Options include the beautiful riverside trails at The Steps of Girrba campground mountain bike park and the single track nirvana at Kiwarrak State Forest closer to the Pacific coast. Click here for minimum age and height guidelines plus essential terms and conditions. Click here for the prices page. 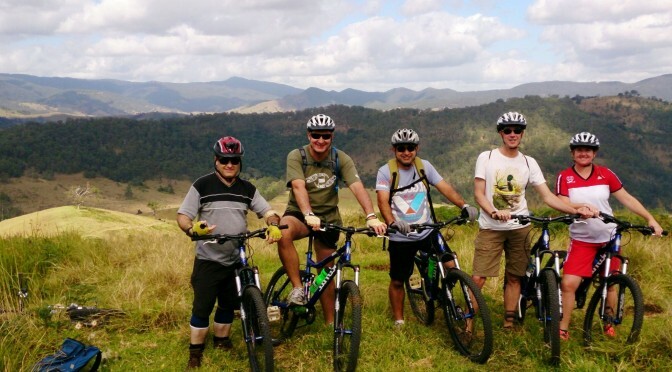 Hone your mountain biking skills with the help of our qualified guides. Take on the ‘pump track’ and put your new talent to the test on our downhill trail or enjoy the shady and scenic riparian route along the banks of the beautiful Barrington River. All sessions are designed to suit the skills or the participant. (Families save 20%). Departing 9.00am daily, includes lunch. This one day tour is Eco Tourism Certified to inspire environmentally sustainable and culturally responsible tourism. Consisting of over 40km of single-track nirvana, the Tinonee trails in Kiwarrak State Forest are a mountain biker’s heaven. Beginners get a taste of what makes mountain biking so addictive while passionate riders find flowing trails, rocky climbs and awesome jumps. You’ll need a moderate level of fitness to enjoy Tinonee. And watch out for the local koalas as you ride through this surprisingly scenic network of trails. Tour includes a fresh picnic lunch. Mountain biking tours include an experienced guide, transport, helmet and Kona mountain bike with dual suspension and disc brakes. Minimum height levels apply (150cm). Bring your own gloves. The ultimate adventure holiday on the Barrington Coast, combining a one day kayaking tour with one day of mountain biking. Accommodation is bunkhouse style with a comfortable lounge, outdoor verandah and walking distance to the pub. We’ll prepare beautiful meals and your guide will be on hand at all times to ensure an unforgettable two days. Includes an experienced guide, equipment plus transport.